Regular Singing in Recess - While I hope that many of the Shiloh Singers have made plans to be at the Missouri State Singing Convention on March 9th and 10th, I also need to remind those who cannot be with our group in Missouri that our regular monthly singing at the Shiloh Museum will be in recess in March. 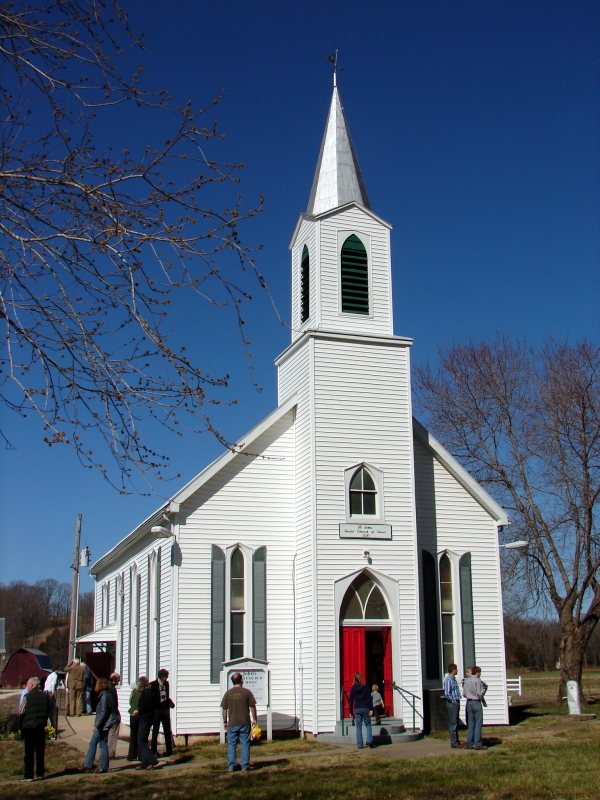 Our next regular monthly singing in the museum's Country Store will be on April 14, 2013 at 1:30 P.M.
Photo: Singers from as far away as Minnesota, Alabama and Georgia gather at historic St. Johns United Church of Christ near Marthasville, MO on 3/10/12. An Invitation - However, there will still be an opportunity for singing and outreach into the NWA community on March 24th at 3:00 P.M. at the Wiggins Memorial United Methodist Church in Fayetteville. Our group has been invited to sing at a special Palm Sunday afternoon program at Wiggins Memorial. Several of us were initially concerned about singing in our own church or attending services when we first heard the date. After Lea and Darryl Criss explained the details of the invitation, the planned program sounded like something the Shiloh Singers could do, that would help the church and maybe recruit a few additional singers for our group. The 12 singers present at the February singing discussed the invitation and agreed that the Shiloh Singers would try to participate in the Wiggins Memorial program. Darryl thought that the audience might also like to participate and sing along with us. The plan is to print some extra copies of the music along with our group's "where to find more information" handout. I'm not sure how long the remainder of the program would last, but there is a Denny's just down the road if any of the singers wish to gather for coffee and/or ice cream before the drive home. Follow-Up - Since there were only 12 singers present in February, and others who were absent will be able to join us, several thought it would be a good idea to ask for an RSVP from ALL the singers who think they can attend so sufficient chairs can be arranged, We understand that last minute events may require a change in your plans, but it would also help us know which parts are covered. Discovery Box - Gail Cowart reported that the Discovery Box had produced the first "draft" video of Dan Brittain's Singing School for the Children's Choir at First UMC, Fort Smith and that segments of the individual follow-up lessons have been edited. Discussions are underway to make the Discovery Box printed materials and AV segments also available online. Our thanks to all the committee members and committed partner organizations who have carried the Discovery Box project forward, including those at UAFS, 1st UMC Fort Smith and the Shiloh Museum. More work on the Discovery Box is scheduled for March and April. ...One More Thing - Thanks again to Bill Caldwell and all the singers and visitors who made the February singing such a success. We'll try to have pictures and maybe a little video from the Missouri State Singing Convention in time for our next newsletter. We hope you'll join all of us singing somewhere in March and April. ..."And we'll sing on!"